What do you do when the Earth is under assault from monstrous creatures by alternate dimensions and you're the only person who can wield the weapon that can destroy them? 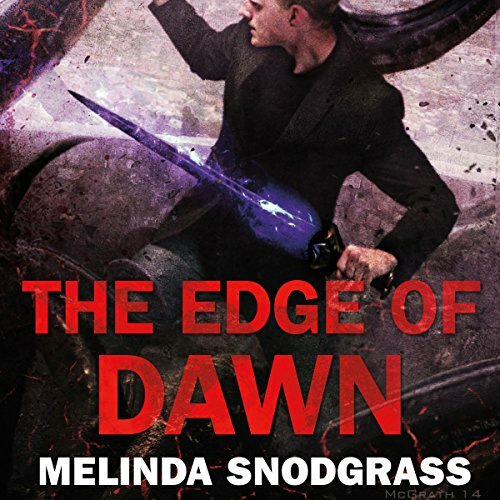 That's the situation facing Richard Oort, hero of Melinda Snodgrass' Edge of Dawn. Lonely and overwhelmed after a series of terrifying, catastrophic global and personal events, Richard is still determined to save the world from the horrific "old ones". He goes undercover in a Christian fundamentalist compound, playing house with an attractive FBI agent. At first this serves only to increase his loneliness, as he misses his real family. But against all odds, he discovers another unique human who can use the paladin's weapon, one who might be able to join him and lighten the burden of responsibility. There's only one problem - Mosi is a nine-year-old Navajo girl. Their enemies are trying to kill both Richard and Mosi - and have already killed Mosi's family. To keep her safe, Richard becomes her guardian. But an error in judgment leads to disaster and betrayal, and now the odd pair will need to summon all their strength to survive the coming battle. From the American Southwest to a secret society in Turkey, the paladin and his ward try to stay in front of their enemies. But the world is at stake - and time is running short. ©2015 Melinda Snodgrass (P)2015 Audible, Inc. This was a surprise! A wonderful, thrill riding, entertaining surprise. I loved everything about this story! You get a bit of mystery, lots of magic, drool worthy action, a cast of fantastic characters, and the upturn of religion had me like, 'what' 🙀 it's a unique spin on what I was taught about religion and how it turn out to be creatively woven into magic and good and evil. I absolutely love the diversity of cultures, races, monsters, locations. All of it together made for an incredibly thought out entertaining listen. And Richard, I just adore him. And I was pleasantly surprised who captured his heart. Please make no mistake, this is not a romance at all, that's why I was surprised who was finally able to help him past his demons and become physically close to someone. After listening to book one and I'm now listening to book 2 I'm so sad about the relationship with Richard's and his dad, his sister has not warmed my heart that much, and I'm confused why'd he'd allow someone who hurt him in the past to be anywhere near him now?! I adored Mosey and Webber ❤️ And I can not believe what a jerk Webber was to Richard in book 1! I mean he broke my heart with how he turned on poor Richard. So it's a real treat to see their blossoming friendship in this story. Everything was right and felt so human and real even with the amount of monsters and magic in this story. another one please...this is a spectacular series. the narration is excellent and the story is well developed.